Don’t aim to reach the top. Aim to do your best and the top will come naturally. These are the lingering words of a witty and inspiring woman leader who, despite many workforce challenges, has made it ahead in the often perceived male-dominated world of technology. 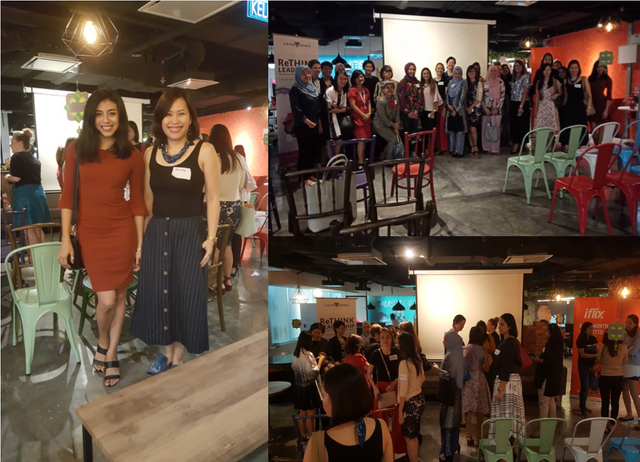 It was an absolute honour last week when my colleague Allison and I were invited to attend LeadWomen’s latest Power Network, held in collaboration with iflix Malaysia. The event was graced by Faizah Mohamed Amin, President of UMW Technology, guest speaker and the woman whose words (cited above) would have surely hit home for many other women in the STEM industries. That said, the topic for the evening was a pertinent one: Women in Technology & Entrepreneurship. We hear about it all the time, now more than ever, that women are still underrepresented on the Boards in tech-driven businesses. It has been an uphill battle against gender stereotypes, partialities and the entrenched attitudes about the ability of women to hold high-power roles. But times are clearly changing! Organised exclusively for women, the Power Network session brought together notable figures and role models in tech. It was an intimate networking opportunity that set an encouraging scene for women to share their experiences openly, ask questions and learn from each other. The event took off following opening remarks by Mark Britt, Co-Founder & CEO of iflix, and a welcome speech by LeadWomen. By that time, we were all ears as Faizah took the floor and what she shared got us thinking. Based on several diversity reports, there are apparently only 26-43% of women in tech companies globally, and the numbers are even smaller when it comes to technical roles and women who hold executive positions. What is it about the tech industry that seems to be causing this? We see new faces coming into the industry but is it sustainable? Who is doing the hiring? Are there enough women on the panel? It can be a lonely world as a woman in tech, and it’s even more lonely at the top. Faizah believes that cracking the industry is a challenge that requires perseverance, and the one thing that puts people off is not being able to be seen or heard. The first obstacle is breaking that glass wall to get into the industry. The ceiling comes next and it will take coherent effort in society to allow it. She encourages those who are stepping into tech to get into it because they truly love it and not simply to hop on the bandwagon. Having the ability to understand tech, paired with business acumen will lead to making a change. Her words left me with a few thoughts. If the lack of female participation in tech translates to fewer women at the top, there will ultimately be a shortage of mentors for other women to aspire to. As reflected in the numbers we often see, this is a major challenge. I’m of the view that it must begin with education to energise the pipeline, followed by hiring and retention which will become less of a problem with more women putting their hand up, diversifying the talent pool and being welcomed in. Faizah went on to talk about Industry 4.0 and the trends around data-driven problem-solving. Concepts such as digital tech, blockchain, AI, data science and analytics can be considered novelties and one of the lowlights of her career is the continuous struggle for people to accept that they have to change to become a part of the ‘new tech’ DNA. Having built and introduced new systems, it certainly hasn’t been an easy task trying to make a group of people change within an environment that they are used to. But knowing that she is paving the way and opening the door for others keeps her going. We must be able to allow failure to happen, and it has to happen fast. She also believes in co-developing to mitigate the risks. Allison and I found it rather refreshing to hear about Faizah’s journey to the top. Despite how far she has come, she is one of the most down-to-earth women and it was a pleasure learning from her in that hour window. Plus, she injected a bit of humour into her storytelling which kept us enthused and engaged through to the end. Diversity, inclusivity and gender equality are not just buzzwords. There is an undisputed need for more women in tech and leadership and we can all play a part to turn the tide and break down those barriers. Change beckons! And the more women speak out, the more impactful the press for progress.